This is one of our workshop days! Whilst Jason was fast becoming an internationally-renowned speaker, Tom Bigglestone was heading up his own projects as Head of Religious Studies. From small beginnings in 2008, The Philosophy Man is now the UK's leading independent provider of P4C training and workshops, and we work in schools across the world. We spend as much time in the classroom as we do delivering training, as we ‘show our working’ in front of children of all ages. Philosophy Man Welcome Video from Jason Buckley on Vimeo. And with the ever-increasing pressure from above, genuine opportunities for face-to-face dialogue and independent thinking can be squeezed out. Our mission to is empower teachers to find the opportunities for independent thinking in their existing curriculum, (and remind themselves of why they went into teaching!). Handouts from training courses often sit in the "INSET graveyard'. It's full of ideas that sounded great on the day but which never quite got passed on to colleagues. So we want to deliver training minibooks that with busy teachers in mind, and following the course our huge range of resources means there's every support for you and colleagues continue using P4C regularly. When we work with schools that have already tried Philosophy for Children, we often get feedback such as, “When we had philosophy training before, we wanted to do it. 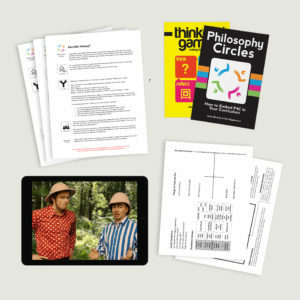 But now we know how to make it work.” So we created Philosophy Circles. In Philosophy Circles, the facilitator usually asks the first question, so the discussion gets started faster. The children’s own questions are still important, but they emerge through discussion. Rather than stages, Philosophy Circles is built around three facilitation principles which run through the whole process. It makes it more fast-paced and versatile for use across the curriculum. Whether or not you've had training, there's no better way to embed P4C than our Primary Curriculum Pack, containing mini-books for staff, 160 session plans, 100 Spot and Stripe videos, and our Discussion Dashboard to aid facilitation. For schools starting out with P4C, or looking to revitalise it. Through staff INSET or observing workshops, followed by twilight INSET. Prepares everyone with the skills and resources to make an immediate start with their own classes. Our Headteachers'/Deputies workshops outline the principles of Philosophy Circles, by putting them into practice through fun and interactive demonstrations, before suggesting ways to share them with colleagues. For schools who wish to extend the philosophical thinking to their whole school community - starting at home! Over 17,000 teachers receive our free weekly resource bulletin. To get it, add your name and email below. Please be careful to enter it correctly, especially if it's a school one with the endless dot this, dot thats! 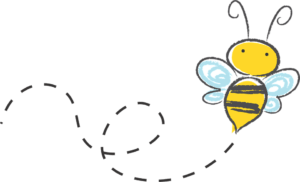 Interested in creating a 'buzz'? Interested in making a booking? Send us a quick message with your contact details below and we'll get back to you as soon as we can. Thanks for your message! One of the team will respond as quickly as they can.